This is an official State record of boundaries and land identified by recorded Deeds . The results are documented by an Official State survey. There are serious issues with the area of Section 32 identified by the DOT on this document. The original GLO/BLM Plat that showed that there is no land mass of Section 32 located east of Bear Creek, and that all of Section 32 is West of Bear Creek identified as 18.5 acres. The document shows that Bear Creek is much larger, with a portion of Section 32 located on both sides of the creek and a serious discrepancy on the location of the Section corner. There are 2 locations shown as the north west corner of Section 32 that are separated by 817.4 feet. The BLM surveyed 18.50 acres tied to the NW Corner of Section 32. The acreage was located on the west side of Bear Creek and the section line ended on the west bank of Bear Creek. Section 32 was not continued across the creek to the East. Instead, the land east of Bear Creek was surveyed, identified, and conveyed by patent in the south ½ of Section 29 by the BLM. The original patent for the fractional portion of section 32 West of Bear Creek was issued in 1882 for 18.50 acres to John Gray (see 1). The field measurements were 891’ from shore of the bay to the corner (north/south) and 1098’ from the corner east to Bear Creek (near the mouth of where the creek meets the bay). A deed is filed in 1888 (see 2) that conveys 11 acres west of the creek between Russell and Caswell. It is unclear how the land was acquired, since there is no record of conveyance to Russell from the original patent holder. In 1889, patent #11475 was issued to Ransom Hubbard for all land in Section 29 except the SE ¼ aka Gov. Lot 6. 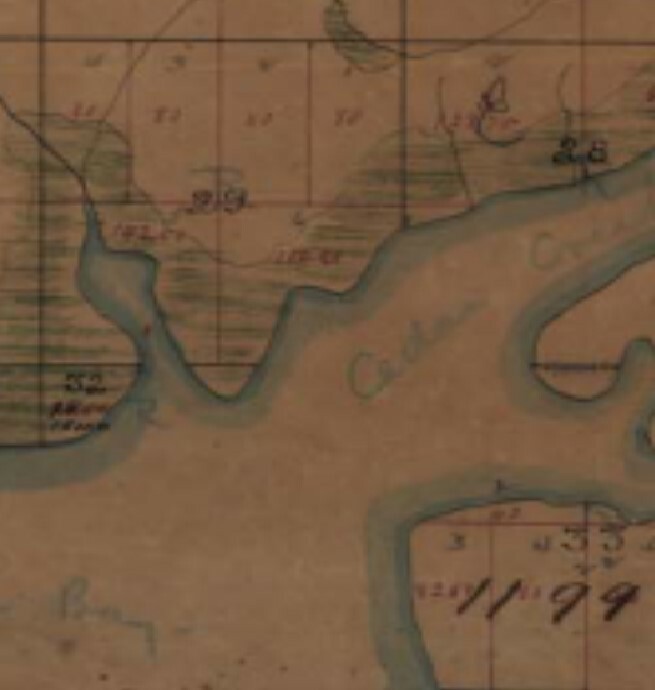 This patent included all land east of Bear Creek to the water’s edge of Choctawhatchee Bay. In 1890, a sheriff’s deed issued through Walton County (see 3) conveys 20 acres east of Bear Creek to McCaskill. There was never land surveyed by the BLM/GLO that was located east of the creek in Section 32, yet Walton County (State of Florida) issues the deed, and the section line of 32 is perpetuated eastward with this document. The land involved with the sheriff’s deed was patented a year prior to Ransom Hubbard. A tax deed is issued to Caswell for Lot 1 in Section 32 (acreage and location unknown) in 1892 (see 4). It would appear that Walton preformed a survey or devised some method to define “lots”. However no records can be found. At this point it appears that Section 32 has grown to 38.50 acres and is on both sides of Bear Creek according to the documents issued through Walton County / State of Florida and GLO. By now there are about 46 acres on the east side of the creek and about 35 acres on the west side identified by deeds, for a total of about 81 acres more or less in section 32. There were only 18.50 acres identified in section 32 in the GLO/BLM survey, all west of Bear Creek. There are two surveys by the Florida Department of Transportation that are referenced in this portion of the report that is relevant to this case. There is a 1955 Florida Dept. of Transportation Job 6059-150 - a 2 page survey with the POB located within Section 32, east of Bear Creek. This area was surveyed by the BLM as the south half of Section 29. A concrete monument is identified on the survey as the ½ mile point of Section 32, also east of Bear Creek. A ½ mile point was not established by the BLM, as all land in Section 32 was surveyed west of Bear Creek. The FDOT survey continues northward to show 2 concrete monuments in the vicinity of the SE corner of Section 16. A 329.90’ distance is shown between the 2 concrete monuments. There is no definitive description that identifies which of the 2 concrete monuments is the SE corner of Section 16, other than the lines drawn with no measurements. Page 2 of the FDOT survey identifies the town of Freeport as found in Plat Book 2 page 67 in the public records. Several deeds of properties in the area also reference the same plat book and page number as surveyed by Deputy W.J. Stephens. It would appear that this document has been removed from the Walton County public records sometime after the FDOT survey was made, as the current book and page shows an unrelated survey to this area. The questionable validity of the Stephens survey is addressed in another portion of this report for Section 15. The POB in Section 32 (should be Section 29) on the 1955 FDOT survey is used to find the location of our corner(s) There are two concrete monuments shown in the proximity for the SE corner of Section 16. There is @ 330’ difference between the 2 monuments. Some deeds in the area are tied to the northern monument, and others are tied to the southern monument. The southernmost concrete monument appears to be the basis for the location of the ROW Deed issued to Adell Gauthier on July 31, 1956, even though the 1955 survey shows the northern most as the corner. Adell Gauthier’s land would not be touching the road if it were tied to the north monument. The only way his land would be in the area of the new road is by relation to the south monument. There is a 1963 Florida Dept. of Transportation Job 60590-2601- 3 page survey that begins in land identified in Section 32 located east of Bear Creek. The BLM did not survey land in Section 32 east of Bear Creek. The area is situated south of our location and the FDOT survey shows significant differences for the identified corner and line locations of Section 32. On the survey, a lightwood stake is noted as a corner for Section 30, but disregarded in the area of the corner for Section 32 . The BLM used lightwood stakes. There is an 817’ east-west difference between two NW Section 32 corner locations on this survey, identified by concrete monuments. Both corners are located too far north when compared to the original 891’ measurement done in 1826. There is a lightwood stake and iron pipe identified 488.31’ south of one of the concrete corners noted, and appears to be in the vicinity of the original survey measurements. 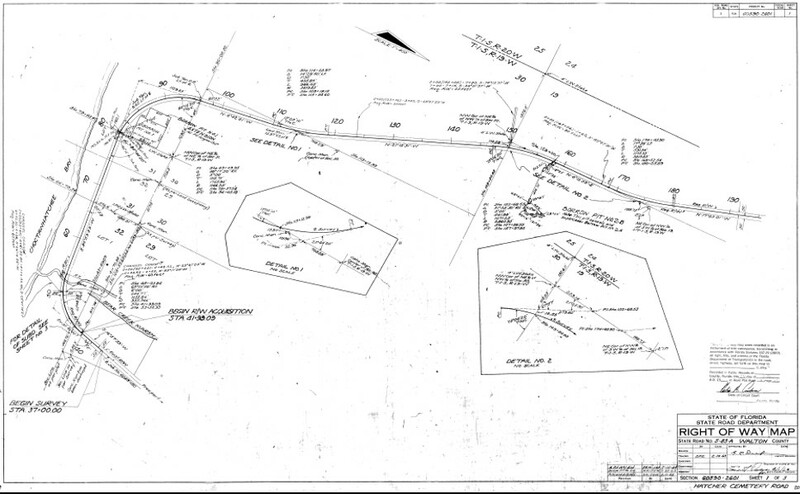 Since the creation of the 1963 FDOT survey, the lightwood stake in the area of Section 32 has been removed, and is evidenced by a 1986 boundary survey done by W.E. Overstreet RLS #2032 for Jack Parker. However, the iron pipe is identified on both surveys. The area of the iron pipe has great potential for recovery of witness trees as verification of the true corner location for Section 32. Another survey by Panhandle Associates in 1988 #3420 identifies both concrete monuments with the 817’ difference as ACC monuments, and both mark the NW corner of Section 32. This survey clearly references the 1963 FDOT survey for dependence. An ACC monument was ruled in 1957 by a Walton County judge as not a true BLM corner, and another was ruled in 2009 as a true BLM corner, even though the Section line is not straight. The 2009 ruling also did not tie in with a recovered BLM lightwood stake on the same line. The BLM maintains that all Section Lines are straight. A hiatus is identified on page 3 of the 1963 FDOT survey as being 194.5’. There are two different section lines for the same section shown. The southernmost line location of the 1963 ROW survey seems to point toward the true vicinity of the original Section 32 corner to the west, when you take into consideration the fractional section locations of 30 and 31, and the 6 degree 10 minute southeast angle (from west to east) that was used to establish the township boundaries in the original federal survey. If you were to extrapolate that line, it seems to fall in the vicinity of the lightwood stake/iron pipe location, and south of the concrete monument that identifies one of two corner locations on the 1963 FDOT survey. A recent recorded deed has been filed for the hiatus located east of Bear Creek in the same area of the hiatus shown on the 1963 FDOT survey. The recorded deed seems to increase the number of acreage in Section 32 by about 5 acres @ 160’n x 1350’e/w (see 22). Walton County Commissioners, the Planning Department, and the County Engineer approve plats of two subdivisions in the area which reference two totally different quarter section locations (1/2 mile points) for the same common corner (see 20 and 21) Approval of the plats support the north/south hiatus (see 22) located between the two ¼ corners identified in Section 32 east of Bear Creek. A half mile monument was not established by the BLM and should not exist. There has been a tremendous amount of litigation and quit claim deed activity with many of the landowners over recent history around this particular area. The two corner locations involved in the litigations are located too far north compared to the original federal survey measurements in our opinion. This much controversy and confusion about the location of the northwest corner of Section 32, and the creation of Section 32 East of Bear Creek with no known or federally established corner location or monument have, in our opinion “created” confusion and doubt about the northeast and the northwest corner locations of Section 27. The identical issues are found at the northeast corner location of Section 15. We conclude that this confusion and doubt has caused the relocation of Section corners all over the township that we would describe as a ripple effect. The confusion is increased and/ or even perpetuated by the work of Walton County surveyors S.K. Miller and Garland Edwards, which established new corners instead of finding BLM/GLO corners discovered in our review of the documents. The subsequent approvals of “subdivisions” by the Walton County Commissioners have contributed to the destruction of the original TRS Grid, in our opinion. The Walton County surveyors use of and judicial approval of section line locations and corners that were never established by the original GLO/BLM survey have not helped in our view but have contributed to and even caused dispute. Walton County surveyors have used the wrong bearings on surveys, this is clearly supported by their own testimony and in and on documents found in the public records (see plat of Walton Heights 1926 plat bk 2 pg 5 and Walton court case # 7120 ACC vs Silcox / Thomason pgs. 43,51,54, 56, 68, 89-90) One example: “travelling northeast to “place” or “set” corners instead of travelling southeast to “retrace” and “find” existing GLO/BLM corners. With the exception of the few documents filed into the public records, it appears - all other records, surveys, field notes, names of County surveyors, general information, and proof of the existence of the Office of the Walton County Surveyor for decades, has disappeared from the public records of Walton County. The corners established by the Walton County surveyors appear to conflict with the original federal survey. A complete examination of Sections 29 and 28 is recommended. This same type of issue existed in Dade County case # with the help of Mr. Walter Robillard, author of “Clark’s on Boundaries and Surveys” (in which the original lines were first upheld, then re-discovered, and re-monumented by order of the court, which resolved that case - if I remember correctly.